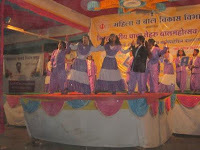 "Marriages are made in heaven, but celebrated on earth." 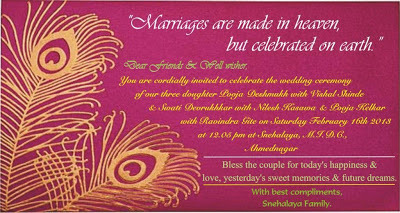 You are cordially invited to celebrate the wedding ceremony of our three daughters -Pooja Deshmukh with Vishal Shinde, Swati Devrukhkar with Nilesh Kasawa & Pooja Kelkar with Ravindra Gite - on Saturday February 16th, 2013 at 12:05 pm at Snehalaya, M.I.D.C., Ahmednagar followed by lunch. 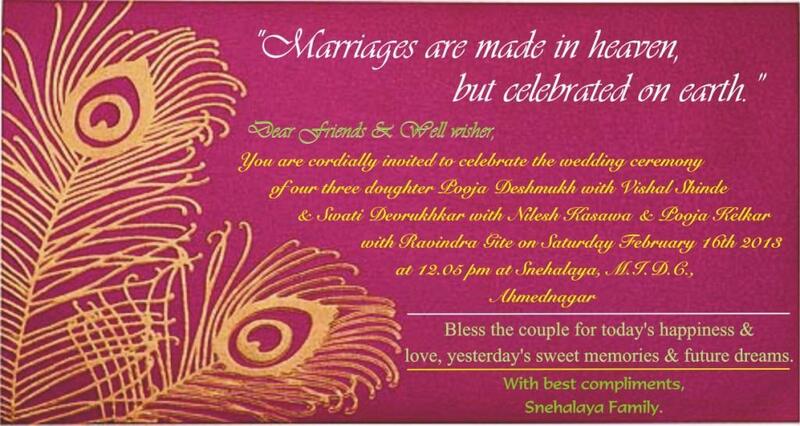 Bless the couple for today's happiness & love, yesterday's sweet memories & future dreams.